Tattoo Removal Transport! On The Road Around Campbelltown. We’re On The Road Around South West Sydney. We thought we’d share some updates with you on what’s been happening at our Campbelltown location in the last few weeks! We’ve recently had our first birthday, and our second year in operation is now in full swing. 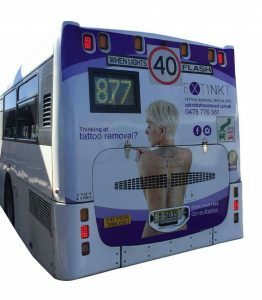 Last month we began advertising on the local buses, and we’re now the first laser tattoo removal clinic in the region to advertise through the public transport system. If you happen to spot us on the road, be sure to take a quick snap. Just make sure you’re not driving when you do of course. We’ll happily provide a 5% discount for your next treatment if you can show us the photo at your appointment. We’ve also recently added a motion header to our Facebook page, which you can see by following the link below. Complimenting this, we have an animated advertisement circulating Facebook timelines in the area. If you haven’t seen it yet hopefully it will pop up soon, and we’ve added it at the bottom of this post for you to check out too. Today was the first day of spring and as Sydney’s weather starts to change, those layers will be coming off and more skin is going to be on show. If you’ve been thinking about tattoo removal, but haven’t yet taken the leap, we’d love to get you started on your way back to happy skin. You’re also more than welcome to take advantage of a free test patch with your consultation. Exciting times ahead for the clinic! We’ve got some great results also coming along, with clients who will soon have achieved complete removal, and some who have decided to fade their old tattoos for new work. There are some amazing artists in Sydney getting lots of attention for their designs. We look forward to keeping you posted with more updates in the near future, and as promised, here is our brand new animated advertisement.